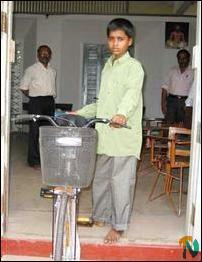 Mohamed Seyadu Mohamed Ali Rafeek (13), of Jinnapuram in Pulmoddai, about 65 km north of Trincomalee district, who had the last reported case of poliomyelitis before Sri Lanka was declared a polio-free nation by the World Health Organization in 1993, received a bicycle at an event held at Trincomalee Social Service Centre Hall Tuesday, provincial health departmental sources said. The Eastern Human Economic Development (EHED), a christian non-governmental organization, donated the bicycle to the boy at the request of the provincial health department. 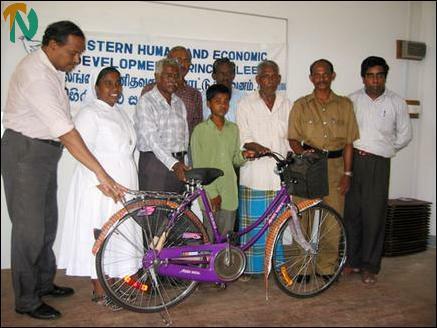 Sister Jayanthi, Health Coordinator of the EHED, handed over the bicycle to Mohamed Ali Rafeek, sources said. The NE provincial department of health identified the boy as the last polio victim.The boy is the eldest in a family of three, all of whom were abandoned by their parents and are now being supported by their relatives in Pulmoddai, a Muslim village of the north of Trincomalee. Provincial department health officials said he was the last case of poliomyelitis reported in the country before 1993 and no new case of polio has been reported in the country since then. The boy is now studying at the Pulmoddai Muslim Maha Vidiyalayam in Grade 8. School authorities said he was a bright student in the class. Though he was fully paralyzed in the early stage of the disease, after being treated under Ayurveda medicine for about six months he is now able to walk limping. However, he cannot move his right hand and leg properly as both are permanent affected by the disease, medical sources said. NEPC provincial health department officials Dr.T.Thavakodirajah and Dr.E.G.Gnanakunalan, EHED official Mr.R.M.J.Thangarajah and health ministry officials participated at the event.